The Law and Politics Book Review, sponsored by the Law and Courts Section of the American Political Science Association and maintained by The Institute for Law and Society at New York University School of Law, presents a comprehensive database of law and political science book reviews. 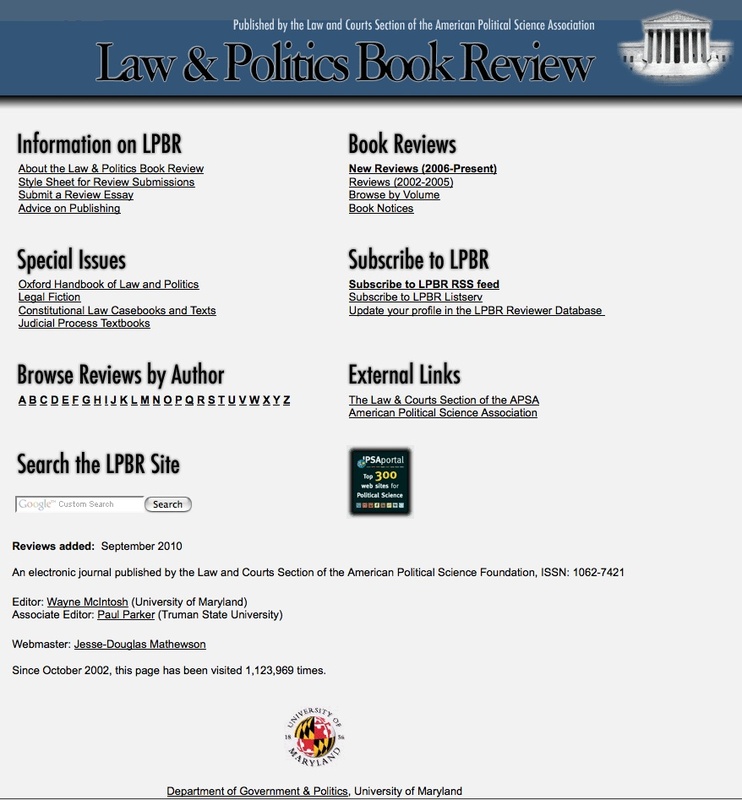 LPBR indicates it reviews almost every book about the legal process and politics, offering longer reviews than are usually published, and making the reviews available within six months of the reception of the book. LPBR material starts from March 1991 and is updated monthly. Past issues and reviews remain available, browsable, searchable and retrievable by all users for free. Free subscription is available, giving subscribers some additional services as a book notice, providing a brief summary of the contents of reference works, previously published materials, textbooks, later editions of books previously reviewed and other publications since 1999. Subscribers can also receive the full-text reviews by email or receive notices of new reviews as they are published, with links to their location on the LPBR website. A very simple search feature is available for retrieving material in the Review’s issues. A customizable advanced search feature in the LPBR website is also possible through Google search. The whole website is very clear to be navigated. Some selected links are provided as well.